Initial workshops took place in Peterborough in May. These were held in partnership with East Timorese Association. You can view some of their personal accounts which are now on their website. In September a major workshop was held in Thetford (Charles Burrell Centre) in partnership with the Portuguese Community in Action (East) CIC and Inspire Focus. This workshop was led by Adelina Pereira, the presentation is available to view here. 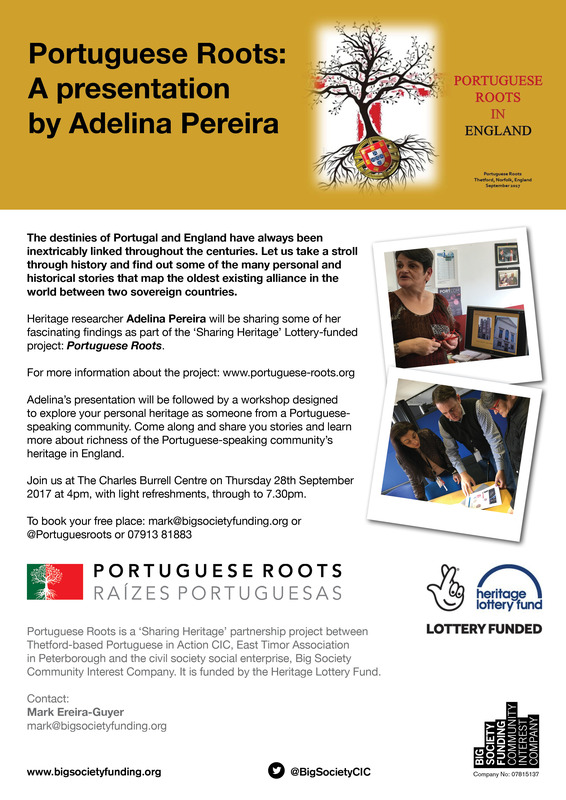 A group of young filmmakers from Inspire Focus made a short film for the project, examining the history of the relationship between the UK and Portugal, and also interviewed some local people from the Portuguese community in Thetford. Their film can be viewed here. Born and raised in Cape Town, South Africa, Adelina Pereira was already a young adult when connected with her ancestral Portuguese cultural and linguistic roots after deciding to leave her native land to settle in Portugal in 1978. Here she taught herself to read and write Portuguese, which now she does most fluently. During her time in Portugal, she also cultivated an avid interest in the country’s history and literature. Over time, she has developed a particularly interest in the more unknown and overlooked aspects and stories of the Portuguese Diaspora, seeking when and wherever possible to bring these to light. Of her many professional activities over the years, she tends to highlight her time as an English language teacher, a translator and voluntary community journalist, having collaborated with several Portuguese language magazines, newspapers and websites in the UK and Canada, where she has a large contact network amongst the Portuguese-speaking community. She has also carried out and provided historical research for a number of literary projects.